Rachel Bird of Kingsley, Iowa, didn't have a date for her prom on Saturday. 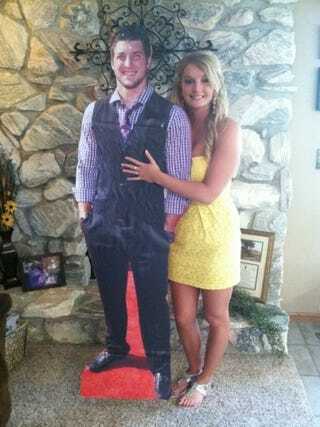 She really wanted to go with Tim Tebow. She tried asking him to go via Twitter. She tried contacting his agent. She also tried the Jets. Nothing. Undaunted, Rachel did the next-best thing: She spent 20 bucks on a life-size color print of Tebow and glued it to some cardboard she and her mother found in the trash behind a hardware store. Presto! A prom date certain to keep his hands to himself. "He was a cheap date, and he didn't talk much," Bird joked. "And when I asked him to stand in a corner, he did. I don't think it even hurt his feelings." He acted the same way with the Broncos. Cardboard Tebow is just like the real thing!